Alright kids, one more Halloween post…we’re almost to the Samhain finish line, and then we can let the Thanksgiving and Christmas and Hanukkah and Kwanzaa and New Year’s Eve fatigue settle in. I’ll pause for a second to let you recover from that massive assault of originality. But in all seriousness, one of the cleverest costumes I’ve EVER seen was the brainchild of my imaginative friend Wendy. She once fashioned a costume comprised of a black slip to which she’d pinned small black and white photos of Sigmund Freud: she was a Freudian slip! And given where we live and the bars we visited, NOBODY GOT IT. She was so irritated at having to explain her costume over and over again that, by the end of the night, she transformed into the Hulk and took those fools to school. Then she gave us a ride home and turned into a pumpkin. Another of my favorite costumes (seen on someone else, of course) involved a giant cardboard milk carton perched on a young man’s shoulders; a hole had been cut out for his face, over which “Have you seen this child?” was scribbled. 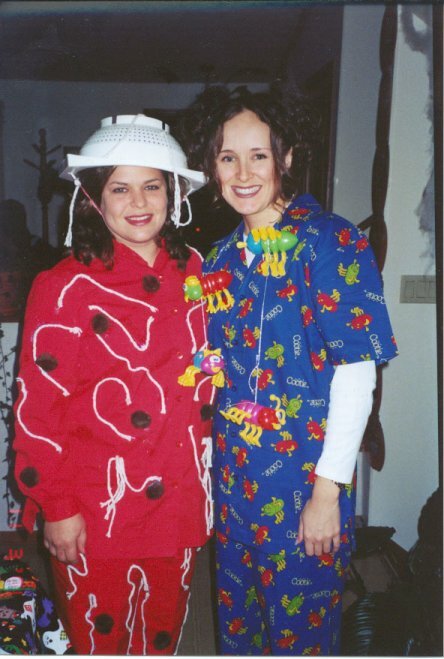 I know I asked this question earlier this week at my own blog, but what’s the most creative costume you’ve ever worn? How about the neatest costume you’ve seen on someone else? Love the Freudian Slip. I may give that idea to my daughter for next year. Is that okay? Also, love the picture and you look exactly the same… haven’t aged at all!! Jenny: that Larry Craig costume is hilarious! I just heard one about a group of people carrying around fake trees, holding flashlights under their chins. They’d sit around really still under the trees, then get up and move to a new place and repeat the charade. They were The Blair Witch Project. Hilarious photo, Jess! As for my costumes, I don’t know that I could choose a “most creative” as they were all fairly out there. Nothing clever like a Freudian slip though. Larramie: no, she’s real, I swear! LOL She’s my “imaginative” friend LOL 🙂 But funny you should ask about the idea contribution…I actually did include some amusing anecdotes from her life!